The John Deere snowmobile experience lasted about a decade. The early 1970s saw John Deere enter the snowmobile market with sleds that channeled Bombardier’s best-selling Ski-Doo Olympiques of the period. It was not coincidental, but John Deere didn’t have an exclusive engine supplier or an eager-to-own fan base of snowmobilers and Ski-Doo was king of the snows. John Deere was king of the farmlands. And wanted a sled to capture buyers’ attention. By the mid-1980s when John Deere decided that lawn tractor production rather than snowmobile production provided more sensible profitability for its Wisconsin-based Horicon Works factory, the agricultural products giant had planned to introduce a strut type front suspension for its fourth generation of sleds. While Deere’s initial “400” and other early models could be called copycats of Ski-Doo, future models showed innovation. Well, that second generation, often referred to as “bridge busters,” didn’t innovate in the weight department. It had been Deere’s goal to strengthen its sleds, but the company went overboard and made them heavy, bulky and poor handling. Learning from their errors and sensitive to a new world (for Deere & Company) of criticism, Deere engineers totally revamped the product line and brought light and nimble handling models to the snows. Among the first entrants was the Trailfire. The two-up Trailfire achieved 30-plus miles per gallon in a magazine-sponsored fuel economy run over a 20-mile course. Where heavy-duty meant heavy iron in the world of tractors and combines, the world of snowmobiling meant light-footed for over snow performance. That second generation of sleds didn’t go over snow so much as it plowed through it. The Trailfire proved a polar opposite. And although Deere didn’t have an exclusive engine supplier, it did have an arrangement with Kawasaki, which used nearly identical engines in its own Kawasaki-branded sleds. Those engines worked through finely-tuned clutch setups that included a Comet drive with parameters identified by Deere engineers to provide ample on trail “go” and above average fuel efficiency. In the Trailfire era, gasoline supplies were spotty and prices tended to elevate without much warning. Sound familiar? That was one reason Deere engineers worked to provide good fuel economy for its Trailfire series. To prove their acumen, the Trailfires tended to do very well in fuel economy runs of the time. In fact in a snowmobile-sponsored fuel economy trial, a 1982 John Deere Trailfire LX with a 440cc fan-cooled twin managed 33.4 miles per gallon, which was better than the 25.1 mpg a 1980 Trailfire 340 achieved. As the magazine editor and official overseer of the fuel economy runs at that time, I suggest you be cautioned that the trials were run over a very deliberately chosen 20-mile course that consisted of long open runs and very few road crossings. And consider that speeds averaged between 20 and 25 miles per hour. Then, too, the sleds were ridden and maintained by factory personnel. The chances of a real-world rider getting such mileage numbers were, at best, unlikely. But, then, these fuel economy runs proved as consistent as the coast-to-coast Mobil Economy Runs of the 1950s and 1960s. The results of the runs were verified and the sleds did get the mileage claimed. It’s unlikely any snowmobile enthusiast would ever drive 20 miles at such slow speeds. Well, at least none that we know! We also conducted high speed and handling runs back in that day and time, too. The new breed of lightweight John Deere trail sleds was truly nimble and could turn on a 9/16-inch washer. Handling came from the Trailfire’s extremely low center of gravity and lightweight character. While Kawasaki provided the base power for the Trailfire, Deere engineers established their own specifications. For example, the Trailfire’s fan-cooled 436cc Kawasaki twin used a single 34mm slide valve carburetor. The Kawasaki Intruder 440 featured a similar two-stroke powerplant, but Kawasaki engineers went with dual 32mm Mikuni slide valve carbs. The clutching packages differed as well. Deere chose a Comet drive set to its specs and a driven of its own making. The Kawasaki used its own design. So there would be no confusion, John Deere’s Kawasaki-sourced engines were renamed as Deere Fireburst powerplants. 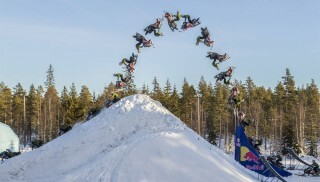 So, you see, this whole sharing thing predates the Arctic Cat/Yamaha hook-up by decades! To the Deere engineers’ credit, the Trailfire concept provided an excellent backbone for future higher performance models. While not exactly the same structure, the Trailfire concept served as the underpinning for Deere’s liquid-cooled Liquifire series, which featured a Kawasaki liquid-cooled 436cc twin. 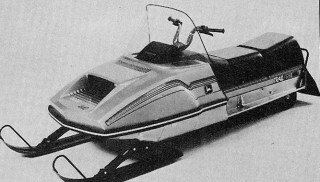 The Sportfire was a fan-cooled version of the Liquifire and designed as a solo saddle sport sled, leaving the Trailfire in the family way. These John Deere sleds had to compete with the Polaris TX-L Indys and Centurion 500. 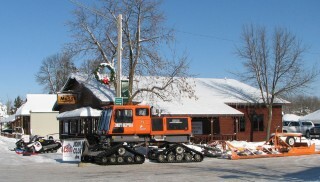 The Trailfire sold against Arctic Cat’s popular Panther and Ski-Doo’s Everest. When introduced, the new breed of Deeres enjoyed the benefits of oil injection and CD ignition. These things don’t seem like big deals today, but in the late 1970s and early 1980s it set sleds apart. Weight wise the Trailfire LX claimed a dry weight of 388 pounds! Today’s lightweight sleds make news when they clear the 400-pound hurdle. We can’t pretend that we weren’t biased in favor of the Deere snowmobiles. For enthusiasts and snowmo-writers alike, Deere & Company snowmobile executives were first class. Why not? The company had a sterling heritage and snowmobiles sold into its corporate landscape of agrarian roots. Still, when the time came to make a corporate decision to drop the snowmobile line, the decision proved far easier than those of us in the sled biz thought. One day Horicon Works stamps out sled chassis and the next day lawn tractor platforms roll off the line. Life went on, one Deere product at a time. But in the interim, John Deere proved that it could make a world-class snowmobile that could handle as well as any competitor and get the best fuel mileage of any full-size two-up sled. When the end came, there were Deere prototypes with strut front suspensions and the appearance in 1982 of a new series of direct drive sleds in the Snowfire and Sprintfires. John Deere managed quite a turnaround in its decade of producing snowmobiles. 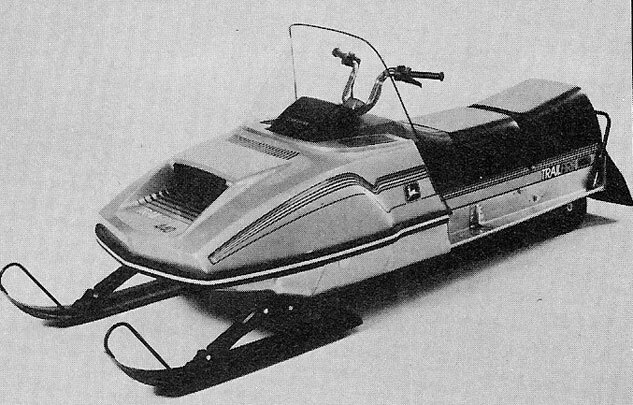 The early 1970s models borrowed from the Ski-Doo designs and the final Trailfires evoked an internal engineering path that brought the best of snowmobiling to its product line. As it turns out, the John Deere partnership with Kawasaki would endure with Kawasaki power fitted to some Deere lawn and garden products. And, Deere has proven that it didn’t totally abandon the powersports world as it now produces a top notch side-by-side all terrain vehicle in its RSX 850i. 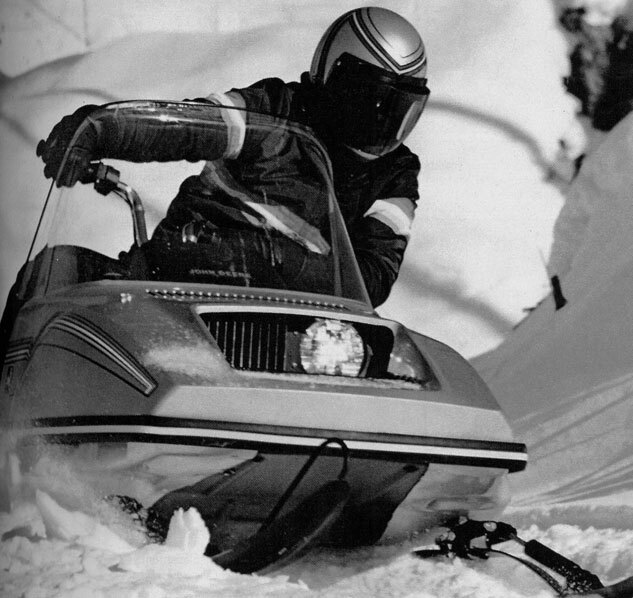 These vehicles continue a legacy built on snowmobiles.